In the summer of 2011, while touring the Boston Health Care for the Homeless Program, I stepped off the third-floor elevator into Barbara McInnis House, looked around, and began to cry, (and I’m pretty sure it was what Oprah refers to as “the ugly cry”.) Those accompanying me — my daughter, two of my grandchildren, and our tour guide, Manager of Volunteer Services Carrie Eldridge-Dickson — at first looked at me in surprise. After all, we were viewing a beautiful, pristine environment decorated in pastels — a state-of-the-art facility which provides “medical respite care”, short-term medical and recuperative services, for homeless men and women in Boston, Massachusetts. I felt as if I’d stepped into an ideal world. My companions’ surprise turned quickly to understanding. They shared the comprehension that my tears were in part joyful at what has been accomplished there, but that they also conveyed frustration at how few of our homeless brothers and sisters will ever experience the level of loving and dignified care expressed in the atmosphere surrounding us at that moment. The 104-bed Barbara McInnis House is a medical respite care facility spread throughout three floors of Jean Yawkey Place, Boston Health Care for the Homeless Program’s central facility which opened in May of 2008. The building also houses a primary care walk-in clinic with ten exam rooms and four meeting rooms for mental health care, a dental clinic with five operatories, a pharmacy, office space for “street” and “family” outreach teams, and the organization’s administrative offices. Barbara McInnis House provides 24-hour care for homeless men and women who are too sick for life on the streets or in shelters but not sick enough to occupy acute care rooms in area hospitals. It has a dining room that serves patients three nutritious meals a day, and a large common area and outdoor patio — all under one roof. The cellar-to-roof renovation of this former city morgue and forensic research facility now addresses the unique medical needs of the city’s homeless men and women. It was made possible through the combined generosity of private, foundation and corporate donors. BHCHP raised $42,000,000 in the organization’s only capital campaign in its 26-year history. Jean Yawkey Place sets the stage for the model of ‘integrated care’ practiced at BHCHP. The organization’s web site, www.BHCHP.org, describes the complex challenge of tackling health care among the vulnerable homeless population. “Many homeless patients struggle with at least one substance abuse problem, at least one chronic physical condition and a psychiatric illness. Each condition is often preventable and manageable… on its own. But, in combination and left untreated, such health problems become compounded and all too often fatal. Medicine, in general, and homeless medicine, in particular, have long grappled with addressing these interconnected aspects of a patient’s healthcare in a coordinated way. In the traditional care model, behavioral health care and medical care operate independently. The integrated care model at BHCHP unites physicians, physician assistants, nurse practitioners, nurses, case managers and behavioral health professionals in a close collaboration. They follow patients together and separately in a variety of settings: on the street, at Barbara McInnis House, in outpatient clinics and, as needed, in shelter or housing. No homeless person is refused treatment at BHCHP. The professional staff provides medical treatment to homeless men, women and children at eighty locations across the city — in adult and family shelters; in two hospital-based clinics; in emergency, transitional and permanent-supportive housing; and through home visits to formerly long-term homeless patients who are now housed through the Housing First initiatives in Boston. They also provide care on the street, in alleyways and under bridges to those “rough sleepers” who avoid shelters. In 1984, a community coalition consisting of eighty people representing shelters, homeless service providers, community health centers, nursing and medical schools, state and city governments, homeless persons, and advocacy groups was convened by Boston mayor Raymond Flynn and Massachusetts governor Michael Dukakis. An extensive community needs assessment to identify gaps in existing health care services was then conducted. Initial funding for the program came through a pilot grant of $300,000 annually for four years from the Robert Wood Johnson Foundation and Pew Charitable Trusts, subsequently matched by an additional $250,000 annually from the state of Massachusetts. City wide cooperation and ‘buy in’ strikes me right away as a predictor of the program’s probable success, and, in particular, the inclusion of homeless people and their advocates in the planning. All too often, critical issues of how service is to be conceived and delivered to the homeless community is decided by committees comprised of those who have never experienced homelessness, without ‘grass roots’ input. Such a comprehensive network early on hopefully precludes the ‘fiefdom’ approach of non profit organizations that can occur in cities, resulting in duplication of services and competition for funding. What is meant by ‘continuity of care’? 1. Continuity of care from street and shelter to hospital requires an enduring and trusting relationship between the doctor or clinician and patient. 2. Multidisciplinary teams should deliver care. 3. BHCHP should act as a catalyst within the mainstream health care system to ensure that the special needs of homeless persons are addressed. 4. BHCHP should serve as the “glue” linking hospitals and health centers with the community of shelters and homeless service providers. 5. BHCHP should strive to bridge medicine and public health. It is also significant that BHCHP is located near two teaching hospitals, Massachusetts General and Boston Medical Center. BHCHP has walk-in clinics on the campuses of both facilities. Colleges and universities are now educating healthcare providers in increased sensitivity to the particular needs of various ethnic and social groups. This is especially important as the homeless population is one which requires special care in building trust and relationships, both because of possible health issues such as mental illness or addiction, and because attitudes toward homeless people in society as a whole tend at times to be negative, and opportunities for rejection abound. One only has to read the comments section of newspaper articles on homelessness — where homeless people are frequently referred to as ‘bums’ or in other derogatory language — to understand the negativity which can be directed at people living on the street. This attitude in the public at large may be a more powerful determinant of the quality and scope of the health care offered to the homeless population than one thinks. For example, some nonprofit organizations seeking to provide health care to those living in poverty may be hesitant to include homeless individuals within their scope — even when they believe they are deserving and needful of help — because they may feel that the ‘homeless’ label will impede funding efforts. So, at the heart of the mission of any program offering health care to those living in poverty must be the consideration of this question: Are people experiencing homelessness deserving of compassionate care? Whether or not to include homeless healthcare in programs may in part be a matter of conscience, where non profit leaders either bend to public pressure and opinion, or stand firm in the moral commitment to treat all human beings as equally deserving of inclusion in a community of care. The decision at the outset by the founders of Boston Health Care for the Homeless Program to emphatically declare that individuals who are homeless are entitled to and would be provided with top tier, continuous and compassionate health care, provided in an integrated model by on-staff medical and clinical professionals, and with the assumption of the inherent worthiness of each patient to receive such care, regardless of circumstance, represents a rare commitment, but one that seems to have been met there in an extraordinarily successful manner. The success of the program says a great deal about an inspired vision; about the wisdom of its founders and their careful planning; about a limitless amount of dedicated work and commitment; and also, not to be underestimated, about the political and moral will of a public which supports and undergirds the idea that those who at this moment live in society’s shadows are nonetheless deserving of its best. ~~ BHCHP has operated in the black for all of its 26 years and has brought medicine that matters to tens of thousands of homeless men, women and children. ~~ BHCHP employs close to 300 doctors, dentists, physician assistants, registered nurses, nurse practitioners, psychologists, psychiatrists, mental health case workers, chefs, building and maintenance staff, substance abuse counselors, case managers and dental assistants. ~~ BHCHP delivers health care to over 11,000 patients each year. 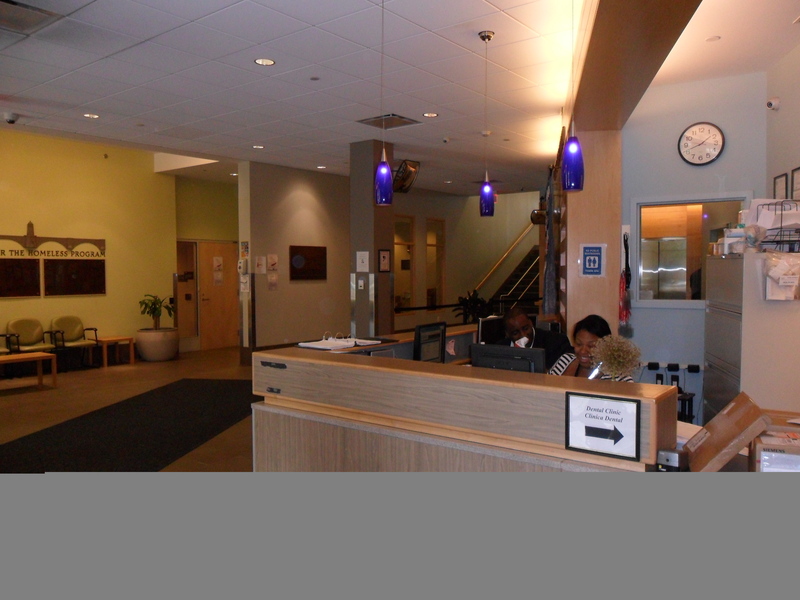 ~~ BHCHP manages the medical care throughout greater Boston’s adult and family shelter system, in two hospital based clinics and at over 80 sites throughout greater Boston. ~~ Over its 26 year history BHCHP has developed a care model that makes it a leader in urban medicine throughout the world…compassionate, professional care from a full-time staff…immeasurable savings in both dignity and dollars. Special thanks to Boston Health Care for the Homeless Program, in particular Tom McCormack andVicki Ritterband for editing, and Carrie Eldridge-Dickson; and to Nancy Johnson, Master’s of Science Candidate with a focus on Community Health, for access to journal articles and for thoughtful discussions of and insights into public health policy. This article appears in the October, 2011 issue of Street Zine, which is available from licensed street vendors across Dallas.